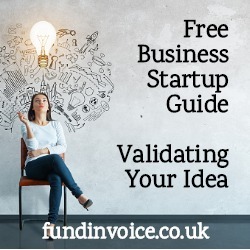 In the last post in this series the Free Business Startup Guide, I covered developing a unique business idea. This post concerns validating that business idea. This means how to check that it is likely to be successful with demand from customers. This is one small step in setting up your own business, but it is critical to its future success, hence it has this post dedicated to it. The objective is to test that there is market demand for your idea, and that you can offer it at a price that will be acceptable to both the customers and your business plan requirements. For example, you could have plenty of demand but if the production price is so expensive noone will pay it, you either need to find a way to drop the price or shelve the idea. You may also have ethical dilemas around the nature of your idea. See our article about "Symbiotic Versus Parasitic Business Models". We can all become attached to the ideas that we come up with. However, you need to try and take an objective approach in order to properly validate your idea. Otherwise you risk your personal bias dictating your view of the likely demand and pricing sensitivities. It is important to remember that as a business owner, you are often not representative of your target audience. Even if you are completely representative, yours is a single view - not very statistically reliable when you are conducting research to confirm the level of demand for your service or product. Common sense would suggest that you need to ask more than one person before taking such a bold step as to launch your own company. If you were to just follow your own opinion about what customers want,that could lead to huge problems if your views are not representative. You could ask friends and family what they think, but again ask yourself: are they really your target customers? Even if the are, do you think are you speaking to enough of them, objectively enough, in order to get reliable feedback? Remember that your friends and family may try to be overly supportive, or they may try to dissuade you from taking a risk by giving you opinions that are biased either positively, or negatively. The most sensible first step is to identify who you believe your customers are going to be, and to use a representative sample of them to sound out your idea. The more defined you can be in determining who you are targeting, the more successful your validation, and your business is likely to be. Using our invoice finance brokerage as an example once again, we could say that our target audience are UK companies. This is true and this makes customers easy to identify. However, only 1% of UK companies use invoice finance service. Therefore it is prudent to be more specific about who our target customers are. In our case we might say, they need to sell on credit terms, they need to have a cash flow requirement and they need to be fast growing (growth is linked to the services that we offer 52% of fast growing companies use invoice finance). By being more specific we are increasing our chances of talking to prospective users, rather than the 99% of companies that won't use our services. We therefore need to validate with those target customer, and also target them in future for marketing purposes. The strongest form of validation is if you have prospective customers already placing orders for your services or products. If that is the case, you might feel that demand is present and that further research based validation is not necessary. I would suggest that depends upon the number of orders that you are receiving. If it's just one or two, you may still want to research demand further before you go ahead, in case those orders are exceptional. Polling and research - you or a research agency (if you have the budget) could contact a sample of your target market and ask them about your proposed offering and the pricing. Their feedback could then drive any adjustments to your product proposition. It could be phone based, face to face (focus groups or one-to-one), or via a questionnaire or online survey. Different methods tend to solicit different levels of engagement. Remember that it is often helpful to be able to respond to information that comes to light in an interview, you can't do that with a rigid questionnaire. For example, if there is an appetite for your product but the pricing sounds expensive, you may want to probe what would be a more acceptable cost point. Dummy adverts - running some test advertising to see if there is a response is one way to test your concept, although this may come at a cost. Email subscriptions - you could put up a test landing page either via social media or on the web, and ask prospective customers to sign up to receive email alerts about your products. Again there are no guarantees that someone who wanted the latest updates is going to buy, but it may be a good indicator of demand (or the lack of it). Once you have conducted your validation, you will have a risk decision to make. Is there sufficient demand for your product, at your proposed price point, to justify launching your business? Whilst that is not the only consideration in making the decision to launch, it is critical to your future success.